Gregory Ellis Buttle was born June 20, 1954 in Atlantic City and grew up in nearby Linwood. He was the best all-around athlete the town ever saw, excelling in baseball, basketball, football and track, as well as swimming and rowing. He helped the Margate Colts win championships in youth football an later lettered in three team sports—plus track—at Mainland Regional High School, and was a champion oarsman with the Margate City Beach Patrol. 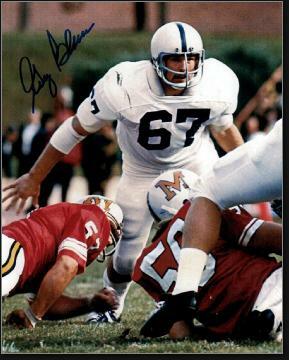 At 6’3” and 220 pounds, Greg was recruited by Joe Paterno to play linebacker for Penn State. Greg was an immediate star for the Nittany Lions, moving into the starting lineup as a sophomore and helping the team go 12–0. He was voted team captain as a senior in 1975. That year, he was a consensus All-American and set a school record with 24 tackles in a game (against West Virginia) and 165 in a season. He graduated as the school’s all-time leader with 343 tackles—a mark that stood for three decades. Penn State was a Top 10 team in all three of Greg’s varsity seasons and won two bowl games. 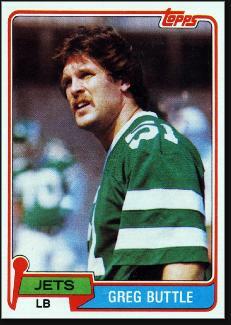 The New York Jets drafted Greg in the third round of the 1976 draft. He started all 14 games as a rookie and all but three of the 110 games he played for the Jets in a nine-year career. Greg returned a fumble for a touchdown in his first year and had a pick-six in his second. Unfortunately, the Jets did not have a winning season until 1981, when they won 10 times and snagged a wild card berth. They faced the Bills in the playoffs and after falling behind 24–0, Greg fueled a dramatic comeback with a pair of interceptions. New York fell just short, losing 31–27. The Jets had another good year in 1982, a strike season, losing just three games and making to the AFC title game against the Dolphins. After a scoreless first half, the Sack Exchange finally yielded a third-quarter touchdown. Miami’s A.J. Duhe returned an interception in the fourth quarter for a TD to make the final score 14–0. Greg had an interception in the game—his third pick in four career playoff games. Greg was a solid all-around outside linebacker. He was strong enough to shed run blockers and could stay with most tight ends in pass coverage. In his final year, 1984, Greg intercepted two passes to give him 15 INTs for his career. Greg was always comfortable performing, dating back to his high school days, when he appeared in musicals. Late in his career and after football, he dabbled in the restaurant and gym businesses but ultimately found his niche as a sports commentator and a frequent featured guest at charity functions and fundraisers. In 2012, Greg was inducted into the South Jersey Football Coaches Association Hall of Fame along with fellow Jet Shonn Greene.